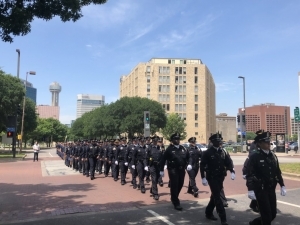 DALLAS (WBAP/KLIF News) — The City of Dallas honored its law enforcement Wednesday afternoon with a memorial service and march. In honor of National Police Memorial Day, hundreds of Dallas Police officers marched alongside city officials about a quarter-mile to Dallas City Hall, where a 45-minute memorial service too place to honor the sacrifices police make. Hundreds of people attended the service, from loved ones of fallen officers to Dallas residents paying their respects during their lunch breaks. 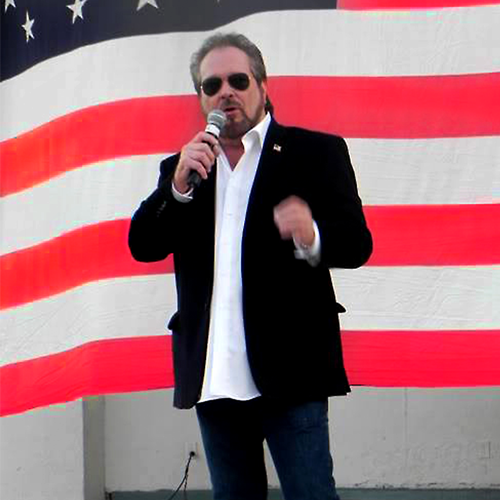 The ceremony included speeches by Hall and Dallas Mayor Mike Rawlings, a 21-gun salute, flyover by a Dallas Police helicopter, performances by the Dallas Police choir, and taps. Many lay yellow roses near memorials on display for the officers who have fallen in Dallas over the years. The pre-ceremony march started at Young and Griffin, near the Kay Bailey Hutchison Convention Center, and ended outside Dallas City Hall. Chief Hall, Rawlings, and the Dallas City Council accompanied the many officers who marched.